Airlines-Manager.com • Afficher le sujet - The Tycoon mode no longer stops! The Tycoon mode no longer stops! A) What is the new system? 1. The Tycoon becomes eternal. The system in which accounts would have been reset as initially planned is cancelled. 2. The system is replaced by a mechanism of successive seasons without airline reset. 3. This implies the introduction of a seasonal ranking and adding diverse rewards (badges and gifts in virtual currency) for the best players. 4. A new challenge for the new season: players who are first today will not necessarily be first tomorrow. B) How is it going to happen in concrete terms? There won't be account reset, but the end of a season followed by the start of a new season. The last day of season 1 will be on June 14, 2018 whereas the first day of season 2 will be on June 15, 2018. During the transition to this new season, players will keep all their hubs, routes and aircraft. This second season will last 6 months and a new ranking will be determined at the end of the season. C) Why did we do that? 1. Several months ago, we asked you about Tycoon's future and the survey's results were clear. We understood you didn't want to start over with your airline after having invested considerable time in its development. Therefore, we decided to listen to you and act according to your request. As a result, we reviewed the system. 2. With this new format and new rules, we try to reward the best managers while enabling you to keep your airline without account reset in a consistent and reasonable way. 3. 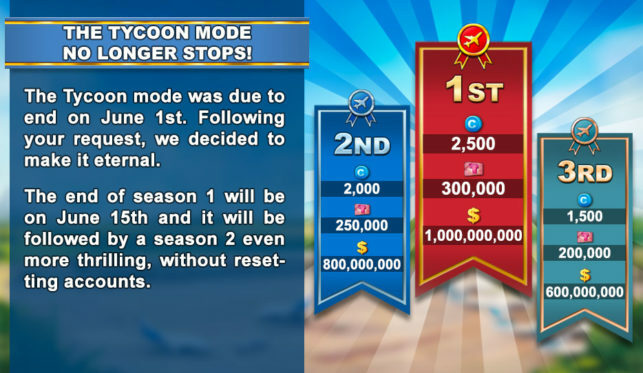 This new season system is also the opportunity for us to promote a system more open and more competitive that will reward players who will be the best managers and the most intelligent over the whole season while enabling newcomers on Tycoon mode to have a chance of being part of the competition. That's why we will introduce a new ranking system soon. For the time being, you will find below the list of rewards for Tycoon 1st season. These rewards will be granted according to the ranking of Structural Profits of the last 60 days (game time) stopped on June 14, 2018, at 4:00 AM (UTC). Each player who participated to the season 1 of the Tycoon version will receive a badge. More new features will be added to Airlines Manager Tycoon later! Re: The Tycoon mode no longer stops! So by the wording 'new season', now it only means that the clock will be reset but nothing else? And if this is correct, I'm assuming that modern generation airliners such as 380/777/787/350 will stay available at our disposal even in 1960's and 70's? It'll certainly be interesting to have the most current aircraft in 1960's... while we're still not getting 787-10 in 2018! For newer players how do they stand any chance of winning against the multi-billion/trillionaires who are at the top of Season 1? This may impact how attractive the game is to a late joiner seeking to be competitive, without spending a whole lot of cash on the game. kannankoh a écrit: For newer players how do they stand any chance of winning against the multi-billion/trillionaires who are at the top of Season 1? "...This new season system is also the opportunity for us to promote a system more open and more competitive that will reward players who will be the best managers and the most intelligent over the whole season while enabling newcomers on Tycoon mode to have a chance of being part of the competition. That's why we will introduce a new ranking system soon." As Staar's quote suggests, there will be a new ranking system that will allow new players to stand a chance against top-ranking players. I can't say more for now, all will be revealed in time. Thanks for the clarification, really looking forward to it! Could you please clarify when Season 2 ends, and how the end of season rankings will be calculated? Unfortunately, I cannot give any information yet, but we will communicate about the 2nd season's end and rankings well before they happen. For the time being, the season is extended to make room for Airlines Manager V3.